Etching on paper by Salvador Dali, titled St. George and the Dragon (1947), signed, one of 250 (est. $12,000-$15,000). Etching on laid paper, final state, by James Abbott McNeill Whistler, titled Turkeys (1880), monogrammed (est. $2,000-$4,000). French Illuminated Manuscript, circa 15th century, from a Book of Hours, on vellum (est. $3,000-$5,000). The auction will start at 11 am Eastern. Featured will be an impressive collection of fine editions from the Print Club of Cleveland, among other rare items. CLEVELAND, OHIO, UNITED STATES, October 29, 2018 /EINPresswire.com/ -- CLEVELAND, Ohio - Gray’s Auctioneers will offer an extensive number of fine works on paper, rare books and illuminated manuscripts at an auction planned for Wednesday, November 14th, online and in the firm’s gallery at 10717 Detroit Avenue in Cleveland, starting at 11 am Eastern time. Featured will be an impressive collection of fine editions from the Print Club of Cleveland, among other rare items. The catalog is up and online, at GraysAuctioneers.com. Bidding is also available on the two platforms Liveauctioneers.com and Invaluable.com. Telephone and absentee bids will also be accepted. For any collector of fine art, literature, or historical texts, the November auction is a celebration of these arts and more. In-person previews will be held Monday thru Friday, November 8th -14th, 10 am-5 pm, EDT. 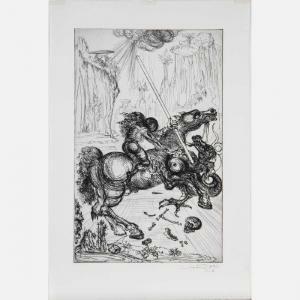 Starting off the auction in Lot 1 is a print of St. George and the Dragon, from 1947, by Salvador Dalí (Spanish, 1904-1989). Dalí had an extensive history with the city of Cleveland through his patrons Reynolds and Eleanor Morse. Reynolds Morse was a highly successful local businessman who first encountered Dalí via a retrospective that was held March 21st, 1943 at the Cleveland Museum of Art. Morse attended with his soon-to-be wife Eleanor and the couple became diligent collectors of Dalí’s work. They even formed a friendship with the artist and his wife, Gala. St. George and the Dragon (1947) is one of Dali’s most recognizable lithographs, depicting the famous Christian legend, which Dali revisited many times, first as a painting completed in 1942, then as a sculpture completed in 1947. Lot 2 is a lithograph Summer Benediction (1953), by Charles Ephraim Burchfield (American, 1893-1867). A visionary artist known for his moody and hallucinatory watercolors, Burchfield graduated from the Cleveland Institute of Art under watercolor artist Henry George Keller. In 1928, Burchfield approached artist Frank Rehn to ask if he could sell his paintings through his gallery in New York City. The two men struck a deal and, fortunately for Burchfield, his paintings continued to sell through the Great Depression. By 1954 he was an esteemed veteran painter and was elected as a full member into the National Academy of Design. 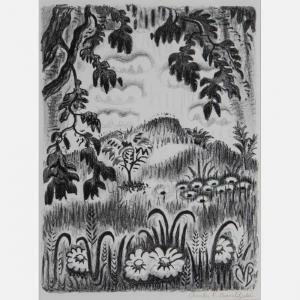 Like many of Burchfield’s pieces, Summer Benediction depicts a hazy and mystical nature scene, almost dreamlike in tone, with a wavy contour and deft use of shading. 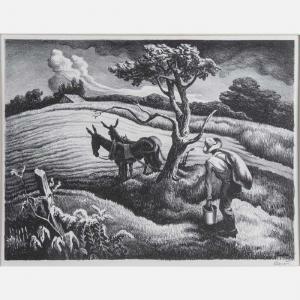 Lot 3 is a print entitled Approaching Storm (1938) by Thomas Hart Benton (American, 1889-1975). Benton cultivated a vivid naturalistic style known as Regionalism, depicting scenes of everyday life in a swirling and almost musical style influenced by his friend Stanton Macdonald-Wright’s synchronism. Benton found his first big break as a muralist, for the 1933 Century of Progress Exhibition in Chicago. Benton went on to prestigious career as a painter, muralist, an educator, writing an autobiography titled An Artist in America in 1937. He often courted controversy for his outspoken political beliefs, advocating for working people and including allusions to America’s race problem in his murals. He eventually alienated himself from the New York arts scene, pushing him to find his true muse in the vast expanses of rural America, as can be seen in the ominous and melancholy Approaching Storm. Lots 4 and 5 are two pieces by Lyonel Feininger (German-American, 1871-1956): a lithograph titled Off the Coast (1951) and a woodcut titled Gelmeroda (1920). An expressionist who was born in New York but was educated and spent most of his adult life in Germany, Feininger began his artistic career as a caricaturist and comic strip artist for The Chicago Tribune, known for his strip The Kin-Der Kids. Feininger eventually transitioned to fine art, joining the Berliner Sezession in 1909 and becoming associated with other leading German expressionist groups, including the Bauhaus. Feininger’s unique expressionistic style, with its hard angles and fragmented light, brings to mind a softer futurism or cubism, finding a warmth in the midst of jagged abstractions, as seen in the two prints up for auction. Also up for bid will be three pieces by the revolutionary French painter Henri Matisse (1869-1954). Considered one of the true luminaries and innovators of modern art in the early twentieth century, Matisse developed a style of flat expressionistic shapes and vibrant color that came to be known as Fauvism. He famously expanded the limits of what was possible with color and form in modern art. Gray’s will also offer three lithographs by the equally legendary French impressionist Pierre-Auguste Renoir (1841-1919): Louis Veltat in Lot 9, La Pierre au Trois Croquis in Lot 10, and Claude Renoir, La Tête Baisée in Lot 11. Renoir befriended Claude Monet, and the two developed an artistic partnership, making similar inquiries into light and color as they became the leaders of the Impressionist movement. Renoir was often penniless and struggled to find financial security from his paintings but by the end of the 1870s had become successful, prolific and fashionable and is now recognized as one of the seminal figures in the development of modernist aesthetics. Renoir painted several thousand paintings in his lifetime and is known for his luminous use of color and brushwork, and unique warmth and sensuality. Also for sale will be four etchings by Frank Weston Benson (American, 1862-1951): The Punter, 1927, in Lot 15; Turnstones, 1928, in Lot 16; Rainbow Cove, 1927, in Lot 17; and Evening Flight, 1927 in Lot 18. Born in Massachusetts, Benson was a contemporary of Renoir and Monet’s and derived great inspiration from them in developing his own contributions to the American school of Impressionism. Benson attended the Académie Julian 1883 and found near immediate success in Europe, traveling across the continent to see exhibitions of his own work and spending time painting. A master of light and color, he produced some of the most achingly beautiful landscapes and portraits of any American painter, and he was a foundational figure in America’s burgeoning art scene in the late 19th century. Gray’s has an extensive collection of etchings this month by American artist James Abbott McNeil Whistler (1834-1903), known for his striking sense of realism and masterful technique. He developed a moody realistic style, later incorporating influences from the burgeoning Impressionist movement and Japanese painters. At age 21, Whistler left for Europe to pursue an artistic career and never returned. While he developed a great reputation as a painter and wit, Whistler’s temper and combative nature fractured many of his close relationships and turned many critics against him. He was deeply defensive of his work and, while his stylistic contributions are not in doubt, his contributions to attitude and ethos have been just as influential on later artists. 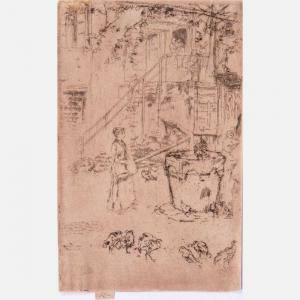 Gray’s is offering seventeen of Whistler’s works in the sale. 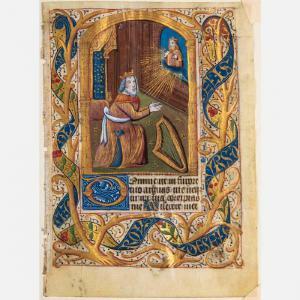 Also up for auction are a number of Illuminated Manuscripts from the collection of Otto F. Ege, dating from the 13th thru the 16th centuries. Coming chiefly from the Middle Ages, Illuminated Manuscripts are manuscripts – typically written on vellum – that have been decorated with painted lettering or pictures, and are often even inlaid with gold or silver, from which the term “illuminated” originates. Illumination was a way for medieval scribes to make important texts legible to both the masses and to a ruling class that was largely illiterate in Latin, the language in which these holy texts were transcribed. They are also the best surviving specimens of medieval painting, and the best preserved. Indeed, for many areas and time periods, they are the only surviving examples of painting. There are 21 for sale. This month’s auction also features a section of rare books, including a first edition printing of Charles Dickens’ beloved masterpiece A Christmas Carol in Prose, Being a Ghost Story of Christmas (1843), including original illustrations by John Leech and printing mistakes included in only the first release; a first edition copy of L. Frank Baum’s classic allegorical fairytale The Wonderful Wizard of Oz (1900), with original illustrations by W.W. Denslow in Lot 145; and a 1935 limited edition printing of Edgar Alan Poe’s Tales of Mystery and Imagination with intricate illustrations by Arthur Rackham in Lot 125. The highlight of this section is Lot 91, John James Audubon’s seven-volume Royal Octavo edition of The Birds of America, From Drawings Made in the United States and their Territories. Consisting of 435 hand-colored, life-size prints, made from engraved plates and measuring around 39 by 26 inches, the set includes images of six now-extinct birds, including the passenger pigeon and Carolina parakeet. The book was originally released by pay-as-you-go subscription, as a series of copperplate etchings released over time, one print at a time, every two-to-five months. Only 120 full copies of this original set are known to survive. In December 2010, The Economist magazine estimated, adjusted for inflation, that five of the ten highest prices ever paid for printed books were paid for copies of Birds of America. To learn more about Gray’s Auctioneers & Appraisers and the live and internet auction planned for Wednesday, November 14th, at 11 am EDT, visit www.graysauctioneers.com. Updates are posted often.